Besides, low chilling peaches are grown in submountainous region and Punjab, Haryana, Delhi and the Western Uttar Pradesh. Peaches requires humid climate with cold winter and dry summer. It is moderately winter hardy and sensitive to low temperature injury. Swelling buds are injured at – 6.5`C. 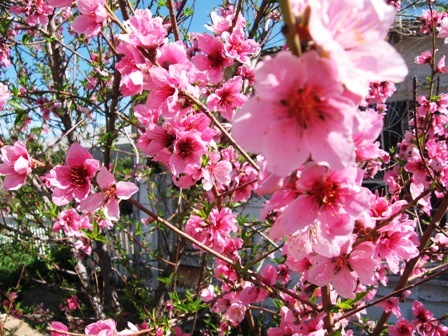 Sites which are free from early spring frost are more suitable as peaches bloom early in the season. The blooming period can be delayed by the application of Gibberellic acid (200 ppm) before leaf fall or by application of Ethephon, to avoid the risk of spring frost. Deep valleys are not ideal sites because cold air settles in these areas, and frost and freeze injuries are very common. The land with gentle slope is ideal. However, on steep slopes peach should be planted preferably in the mid portion. Deep sandy loam soil rich in organic matter is best for its successful cultivation. Peaches are highly susceptible to water logging and prefer perfect drainage. Fertile and heavy soils are hazardous as it makes heavy growth and hence results in winter injury. The pH of the soil should be between 5.8 and 6.8. Acidic and saline soils are unfit for peach cultivation. Important peach varieties recommended for temperate regions of different states are given in the Table 1. Besides these varieties, Stark Earlyglo, Stark Early, White Giant, Starking Delicious and Candor are new promising peaches for midhills of Himachal Pradesh; Floridasun, Dawn Ramber and Dawn Rose for subtropical regions of north India; Safeda Early Cream and SRE 6 for Tarai region of Uttar Pradesh; and Prairie Dawn, Praire Ramber and Praire Rose for cold areas of dry temperate regions (Table1). Yellow fleshed, free from stone; regular producer and relatively free from fuzz peaches are ideal for table purposes. The cultivars which ripen before the onset of rains are ideally suited for commercial cultivation. For canning proposes, peaches having yellow flesh, free from stone, small pit, non-splitting, good symmetrical size and evenly mature are preferred. For dehydration, white-fleshed, sweet peaches having free stone are preferred. The Nectarine is a group of peaches which are fuzz less, smooth-skinned, and usually smaller in size; firm fleshed and may possess stronger flavour and aroma. There are several varieties of nectarines. Wild peach Kateru: It is a very unique peach that grows wild in a small part of the Indian state of Himachal Pradesh. Its fruit ripen in October whereas the normal ripening season for peaches in the area is June end to July. The fruits of Kateru peach are, however, not as good to eat as other peaches. But still this peach, which is virtually unknown outside Himachal Pradesh, is a very valuable genetic resource an d should be utilized for evolving some late ripening variety of peach. This peach has been described separately under the heading Kateru Wild Peach at this website. Peach is commercially propagated through grafting or budding. Peach seedlings are generally used as rootstock, though plum, apricot and almond seedlings can also be used. Some nurseries also use Behmi (P. mira) as rootstock for peach. Since wild species produce more vigorous and hardy seedlings than the cultivated varieties, wild peach seedlings are preferred in the hills. Before sowing, the seeds are stratified at 4 C for 10-12 weeks in the moist sand. The stratification of peach seeds can also be done under natural conditions and cold storage at 4 C or below. Pre-sowing treatment with thiourea (0.5%) or GA (200 PPM) 0r BA (100 PPM) reduces the stratification period, enhances seed germination and improves the seedlings growth. The stratified seeds are then sown in well prepared beds about 5 cm deep and 15 cm apart at a row to row spacing of 20 cm. Seed beds are mulched with 6-10 cm thick dry grass and light irrigation is given after sowing to avoid desiccation of seeds. Seeds start germinating in March. The seedlings become beddable in June, if they are grown in fertile soil with full care, they become graft able in the following winter. Peaches are propagated commercially by tongue or cleft grafting and T-budding or ring budding. In hills, tongue grafting during January- February and T-budding during May-June are performed. However, in plains grafting is performed during November- January and budding during April-June and September. In high density plantation, the distance can be reduced to 3m x3m. In Tatura trellis and Meadow system, peach is planted at a distance of 5m x 1m (2,000 plants/ha) and 2 m x1 m (5,000 plants/ha) respectively. Of the conventional training systems, modified leader and open centre are usually adopted to train peach trees. If sunlight exposure is a limiting factor (hills), vase or open centre system of training is generally used. In this system, at the time of planting, stem is cut to a height of 60-80 cm from the ground level and only 3-4 branches are allowed to develop on it. In the following dormant season, these 3-4 branches arising in opposite directions with wide angled crotches are headed back. The unwanted braches are thinned out. In the second year, 5-7 secondary limbs on the main scaffolds are thinned out and 2or 3 secondary laterals are selected at this stage. All the side braches which grow towards the ground, centre of the tree or vertically straight should be thinned out. The main stem is kept clear up to 45cm above the ground. Peaches require heavy and regular pruning because fruiting occurs laterally only on previous season’s growth which bears only once in its life time. The pruning of peach has two important components—thinning out and heading back of the shoots. Pruning should be done so as to produce 25- 50 cm of growth annually under temperate condition, which is sufficient for maintaining optimum productivity. During early bearing, the selected shoots should be lightly pruned by removing 20-30 % linear growth after corrective pruning should be followed by removal of linear extension growth to the extent of 70-80%. The remaining 50% of selected shoots should be headed back by removing 20-30% linear growth. In general, fruiting shoots should be lightly pruned and alternate ones severely headed back to get sufficient yield and following year’s growth respectively. In subsequent years, the pruning severities in these two braches are changed which maintains the trees in growing and fruiting condition. In July Elberta peach, pruning should be done to retain 40 fruiting shoots and each shoots is headed back to 15 nodes. Where heavy pruning is required, three-fourths heading back +40% thinning out is recommended. Mid-winter is best time of pruning. The peach has a relatively high requirement for N and K. The fertilizer schedule recommended for fully –a grown peach tree in different states is given in Table2. Whole quantity of farmyard manure along with P and K is given during December-January. Half of N should be given in spring before flowering and the remaining half a month later if irrigation facilities are available. Under rain fed conditions, N fertilizers should be applied in one lot 15 days before bud break. The manures and nitrogenous fertilizer should always be applied by broadcasting evenly in the tree basins which should be sufficiently large and should encompass the entire canopy of the tree. It should be sufficiently large and should encompass the entire canopy of the tree. It should be thoroughly mixed in soil by gentle raking. Phosphatic and potassic fertilizers should be applied in trenches of 20-25 cm width and 10-15cm deep made beneath the tree canopy at a distance of 1-2m from the main trunk. The trees should be irrigated lightly immediately after the application of manures and fertilizers. 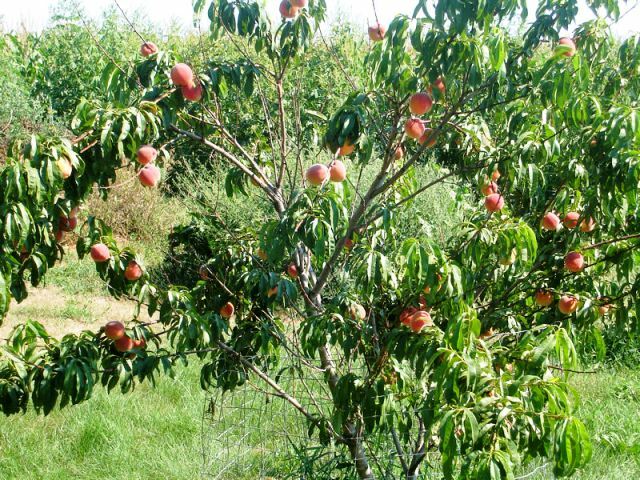 Peach is very susceptible to Fe deficiency which can be controlled by foliar application of 0.5-1.0% ferrous sulphate or by soil application of 50-250 g chelated Fe (Fe-EDDTA) at 20-30 spots around the tree in small holes. Trunk injection of 1% ferrous sulphate or ferric citrate is also beneficial in extreme cases. 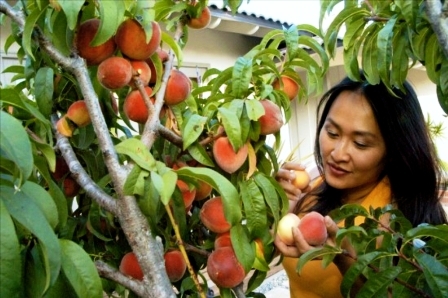 Peach July Elberta in high hills, and Redhaven, Sunhaven, Kanto 5 and Shimizu Hakuto are prolific bearing. Their fruit size remains small as a result of excessive cropping. Therefore, application of Ethephon (300ppm) with Tween 20 at petal fall in July Elberta is recommended for optimum fruit thinning. However, in Redhaven peach Ethephon (600pm) 20-30 days after fruit set when the fruit lets are 20-25 cm in diameter, should be used for thinning. Hand –thinning at 5-7.5 cm fruit spacing at pit-hardening stage is equally effective. Simazine and Atrazine (2.9 kg/ha), Turbacil (0.8kg/ ha) as pre-emergent and Paraquat (4.0 liters /ha) and Glyhosate (4.32kg/ha) as post- emergent herbicides are quite effective to control weeds without any phytotoxic effect. In nursery, Oxyflurofen (0.5kg/ha) and Diuron (2kg/ha) are good to control weeds. To get optimum-sized and quality peaches, irrigation is very much essential. There should be sufficient moisture in soil before the emergence of leaves and flowers. Frequent irrigations are needed during the fruit development. Lack of irrigation, particularly during dry and hot summer result in fruit drop, reduced fruit size and quality. In hills, at least two irrigations should be given during the fruit development period. Irrigation should be stopped a few days before harvesting and at the time of dormancy, when the plants should become sufficiently hardened to withstand cool weather. Due to scarcity of water in hills, drip irrigation is recommended. To get premium price and reduce the losses during packaging and transporting, peaches should be harvested at optimum stage of maturity. A large number of maturity indices—days to maturity, calendar date, fruit size, firmness, sense of touch, pit discoloration, freeness of pit, taste, ground color, sugar, acidity, starch, sugar: acid ratio—have been assessed on different cultivars. The days from full bloom to maturity vary in different cultivars—Alexander, 86 days; July Elberta, 101 days; Babcock, 122 days and Elbert, 127 days. All peach fruits do not mature simultaneously. Therefore, these may be harvested when they attain ripe peaches are harvested by twisting with hand. The peak harvesting period for different peach cultivars in hills is mid May (Shan-e-Punjab) –mid July (July Elberta and Shimizu Hakuto). The peach comes into bearing after two years of planting in the field. The plants bear for about 20 years. The yielding capacity increases with the age of the plant. The average yield of fully-grown trees of different varieties varies from 50to125 kg in hills. In conventional plantations, 7-10 tonnes/ ha and in Tatura Trellis about 23 tonnes/ha yield can be obtained. Peaches ripen very fast as the harvesting season coincides with the prevailing high seasonal temperature. Ripening process declines to half with each reduction of 5.6`C from 21.1`-4.4`C. The fruits ripen in three days at 21.1`C, while in six days at 15.5`C. 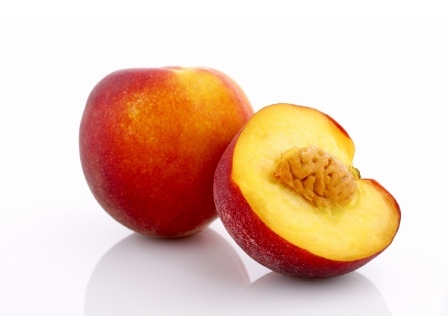 peaches ripen with good flavour and aroma at temperature above 15.0`C, with undesirable flavour at 10`C and breakdown internally instead of ripening at 4.4`C. The harvested fruits must be disposed off as expeditiously as possible. Peaches are graded to fetch better price in the market. Size grading is essential for uniformity and packing in standard cartons of boxes. Peaches are generally packed in wooden boxes. But nowadays universal CFB cartons are also used. These cartons are lighter in weight and consume about one third wood and are easy to handle. Fruits in these cartons fetch better price as there is lesser bruising damage. These cartons need protection from direct rains. Peaches have a shorter storage life than most other temperate fruits. The recommended cold storage conditions are 0`-0.3`C and 85-90 % relative humidity. In these conditions, free stone peaches and nectarines can be kept for two weeks and clingstone for four weeks. Precooled peaches can be stored for 28-36 days. Peaches are frozen in cold storage at -0.9`C. 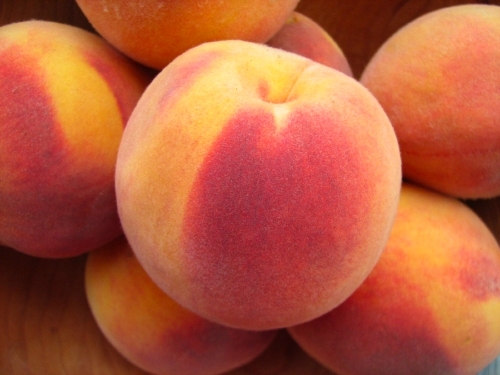 In controlled atmosphere storage containing 5% CO2 +1-2% O2 at 0`C, peaches can be stored up to 42 days. Sunscald causes severe damage to the exposed trunk and main scaffold branches. Shading of branches considerably reduces the incidence. Painting of exposed surface with lime paste and shading by wrapping straw or hay around the trunk and thicker branches is quite effective in mitigating the problem. Splitting of fruits generally occurs at dorsal and ventral sides mostly at the time of pit hardening stage. Sometimes gum exudes from the fruit making it unfit for consumption. Splitting and gumming are accentuated during heavy rains after a long dry spell. The exact cause of this problem is still to be determined.